Wow! Never thought it was this serious. This article from The Economist (http://www.economist.com/node/21559618?fsrc=nlw|hig|7-26-2012|2899296|38085276|NA) describes the problem continental Europe has in creating new businesses destined for growth. Reasons include how countries treat failed entrepreneurs, finances (seed capital), labor laws and legal complexities. 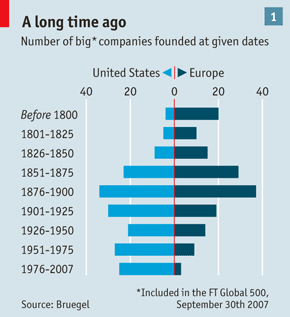 Look at the graphic below with US and Europe’s big companies founded between the 1800 and 2007. Impressive.